Preheat the oven to 350°C. 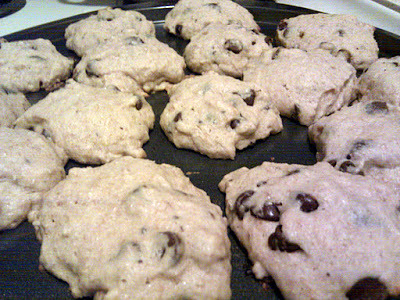 Mix in half of each flour. Then the carab chips. Add more or fewer to your preference. Mix, mix, mix, and hopefully it will become a gooey, muffin-mix-like clump in your mixing bowl with a thousand chocolatey eyes. Apply to baking pan in glops. Let cool to allow them to solidify a little.